Social Media Solution is an application within the Hotel Business Intelligence Suite that allows for an analysis of the social media market. Through this platform the hotel can know what people are saying about its business and its competitors, and unify such analysis in a single Business Intelligence platform. This social media management tool enables businesses to access information from the most widely used social media platforms, bringing together Facebook analytics, Twitter analytics and Instagram analytics, as well information gathered from Google+, Web pages, and other public data sources. The solution allows for the analysis of competitors and the impact reached on followers, adhesions, (likes, favourite, +1…), the spread of the message (shares, RT…), the generated conversations, etc., as well as notes received based on key words defined during the product configuration. In addition, Social Media Solution features an artificial intelligence algorithm that determines whether the content of a message is positive, negative or neutral towards the specified competitor, and identifies the most commonly repeated topics in collected messages. 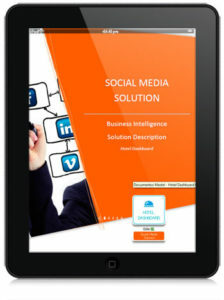 Click on above image to download brochure on Social Media Solutions (PDF). We work as a single united team with market leading profesionals around the world and give our clients the highest quality solutions.